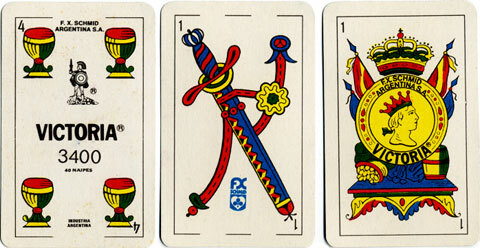 F. X. Schmid (Argentina) S.A.
Spanish-suited cards by F. X. Schmid (Argentina) S.A.
At some point between c1975-1985 the West German playing-card manufacturer F.X.Schmid opened offices in Buenos Aires under the name F.X. Schmid (Argentina) S.A. During this period they acquired the brands "Payador" and "Victoria" which formerly had been owned and produced by Cía Gral Fabril Financiera S.A. The brand names were also briefly used by Joker S.A. When Schmid ceased business in Argentina in the early 1980s, the brand names also ceased to exist and have not been used since. Exactly what happened to them is still a mystery. 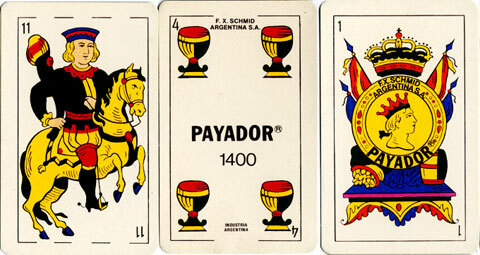 Left: Naipes "Payador" manufactured by Cía Fabril Financiera S.A. for Schmid Argentina S.A., c.1975. The Catalan-style designs are based on those previously used by Cía General Fabril Financiera. Left: Naipes "Victoria", manufactured by Cía General Fabril Financiera S.A. for Schmid Argentina S.A., c.1978. 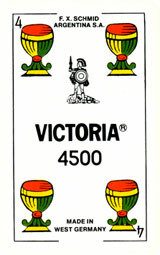 "Victoria" was another brand name used by Cía Gral Fabril Financiera, and also distributed for a short while by Joker S.A.
Left: Naipes "Victoria" manufactured in West Germany for F.X. Schmid (Argentina) S.A., early 1980s. The brand name "Victoria" and the gladiator motif are those formerly used by Cía Gral Fabril Financiera S.A. and Joker S.A. until around 1980, at which point they appear to have become the registered property of F.X. Schmid. However, Schmid soon closed their offices in Buenos Aires and discontinued these brands. The pack shown below is their successor. Left: No.407 "Naipe Español" made in West Germany by F.X. Schmid for export to Argentina, 1985. The Argentine flag is shown on the ace of coins. 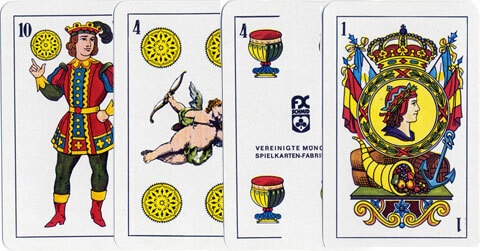 There is a cupid on the four of coins but no mention of a brand name other than No.407.